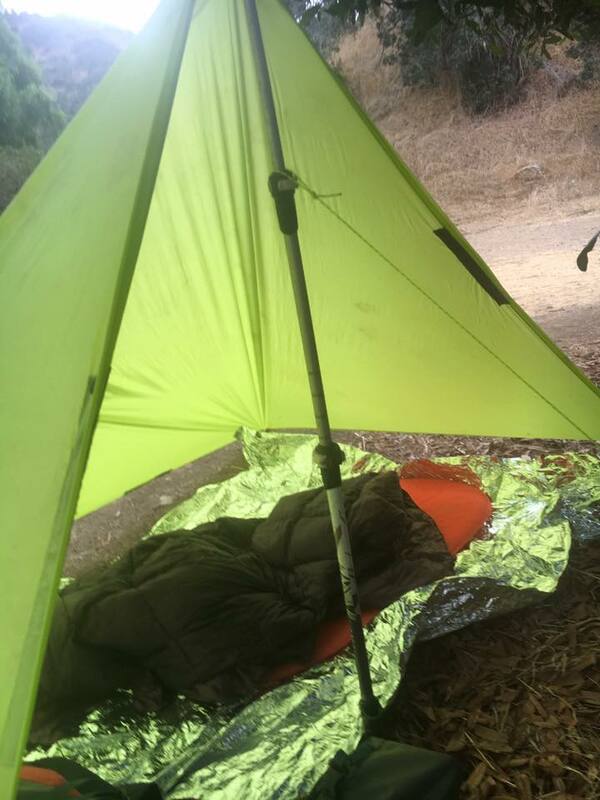 Calling it Quits on the Trans-Catalina Trail – Sam T.G. I wasn’t a complete idiot about it. 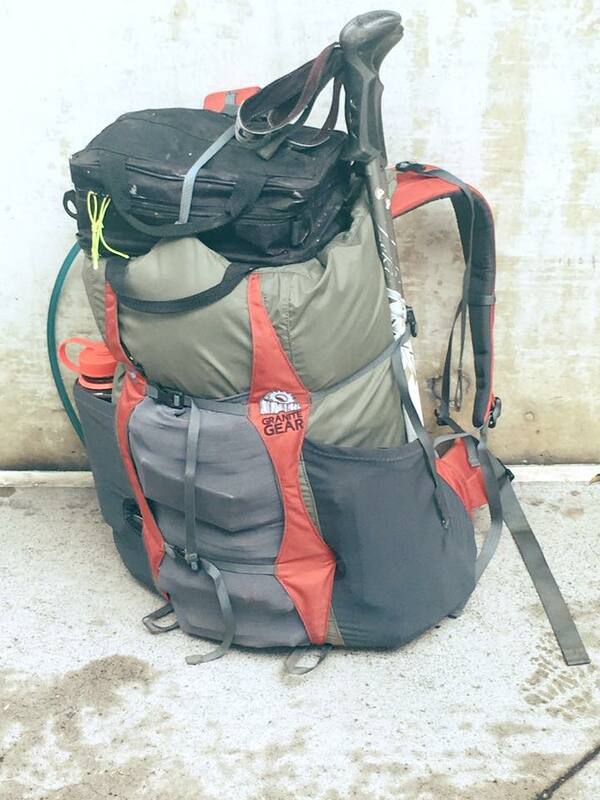 I, at least, started some rudimentary training and significantly lightened my pack. Pictured here is the Granite Gear Virga 2, a frameless ultralight pack weighing at only one pound and a couple ounces. I took my smaller painting kit, my lightweight cookset, and generally put together an ultralight set-up that would have worked wonderfully had I been in better health. Upon arrival a brief walk into the gulch of Catalina’s foothills leads to the town of Avalon’s campground, where I snag a site close to the trailhead. 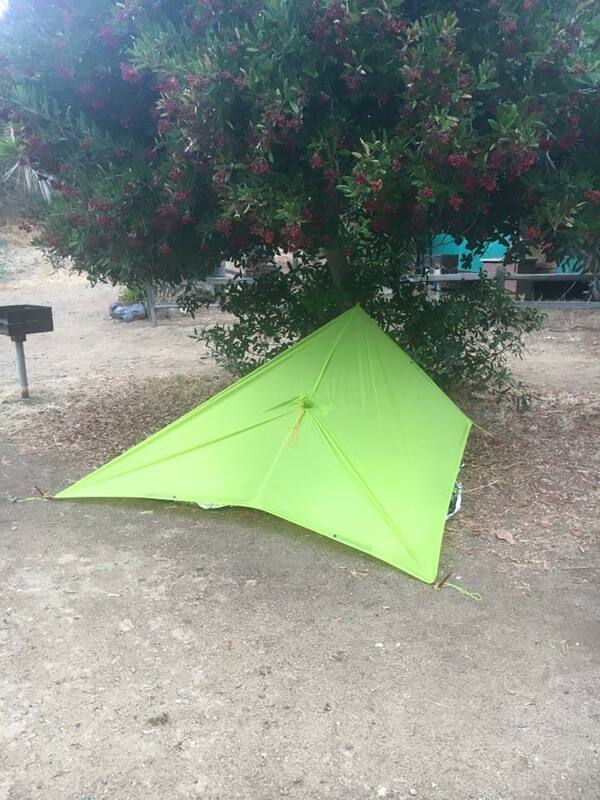 I set up my ultralight shelter (a poncho tarp, a space blanket for ground cover, an XS Thermarest inflatable pad and a costco down quilt) and get some rest. I wake up before the sun rises, my headlamp briefly illuminating the large, reflective eyes and triangle ears of an Island fox. I need an early start to tackle the two-mile climb from trailhead to ridgeline along the Hermit Gulch portion of the trail. The early start is rewarded when the sun rises over the ocean and illuminates the shoreline and interior expanse of Catalina Island while I rest at the top of the climb. I don’t see a single other soul as I walk the dirt service road for a couple miles, then turn inland onto proper singletrack. The chaparral landscape in that early morning mist-laden light becomes otherworldly as the trail climb and dips and slowly winds its way back to the coastline and across Haypress Reservoir, a small recreation area adjacent to a natural reservoir on the island. 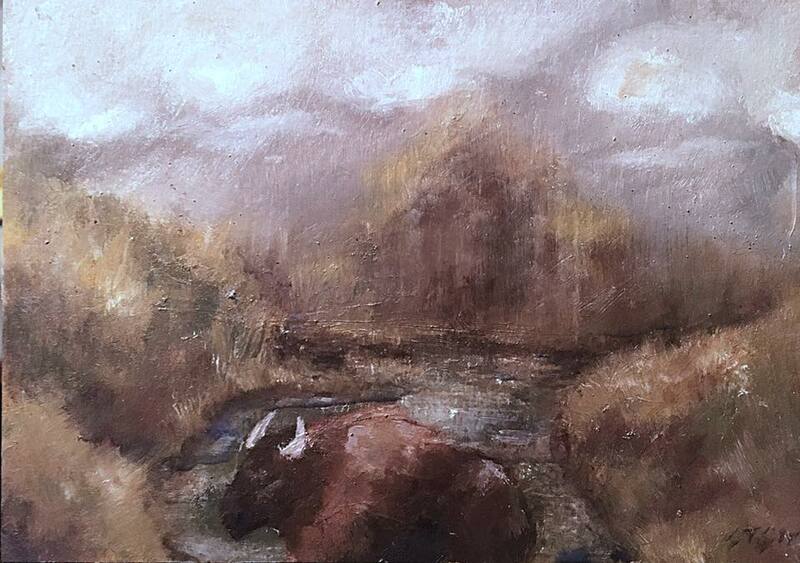 I’ve never seen it with water before, but at that very moment, in the stillness of mid-morning, a bison stands hoof-deep in the shallows of the reservoir. He gives me a disinterested, cursory glance. I take his apathy as a tenuous invitation and stay a respectable distance while I paint him in the light of that cloudy morning. I find the rest of his herd about two miles down the trail, seven large bison in all, eyeing me warily as I bushwhack far off-trail to give them space. It is seven miles into the trail and I am hiking down along a small ridgeline into a canyon and its seasonal spring when a shooting pain lurches across my c-section scar and my legs go weak. I sit by the side of the trail, eat a snack, drink some water, rest a bit and shoulder my pack. Back on the trail. A quarter mile – again, a sharp pain in my abdomen. I sit and stare up at Blackjack mountain, my campground for the night just out of sight around and atop the seemingly insurmountable climb. We arrange for a ranger to meet me a quarter mile away where the trail crosses a service road. I hike carefully, painfully slow and soon am picked up in a slightly muddied truck by a concerned and helpful ranger who makes the ride back to camp a pleasant distraction. The physical recovery of childbirth isn’t the only battle I’ve had to fight. Back at camp I ruminate over some Mountain House under my re-pitched tarp shelter. Postpartum depression turn my thoughts harrowingly critical and morose. Logically, bail-outs are part of life on the trail. Injuries happen, the weather doesn’t always cooperate, any number of factors can lead to calling a hike off. The trail will always be there to be hiked again; make sure you are. Play it safe. Be responsible. Don’t take needless risks – like embarking on a rough multiday when you’ve barely been cleared for physical activity after months of health issues. Thankfully I have amazing friends and family who drove that point home when my illogical mind refused to wrap itself around that. The next morning I feel well enough to pack up my gear and head back into town, a light rain returning to refresh the small town of Avalon. It’s a couple hours until my boat home would arrive. 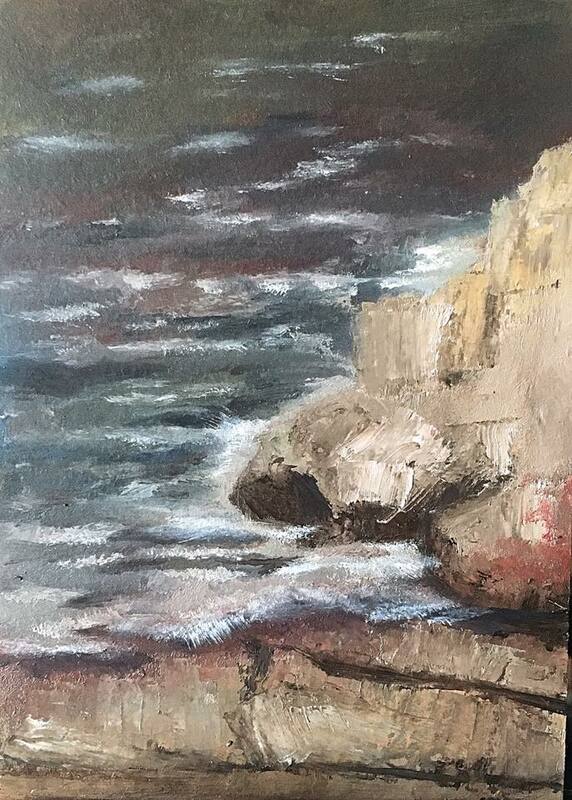 I sit by the shore and paint the crashing waves, finding some solace in the process of creating. Lesson learned – allow myself the time and patience to recover, and find peace and adventure within reach. Seek the balance between challenge and foolishness, between adrenaline and recklessness. I’ve had my trail fix and with a dose of luck walked away without postpartum complications and with the memories of that misty morning on the trail, the glow of a fox’s eyes in my headlamp, the intimidating presence of bison against the sound of crashing waves. The rest of the trail will always be there, after all. Very well conceived and written piece. You are so awesome at using descriptive words to draw me into your perilous situation. Glad you realized that you can try it again another day. The trail will always be there. Thank you for sharing your adventures with us. Don’t stop.